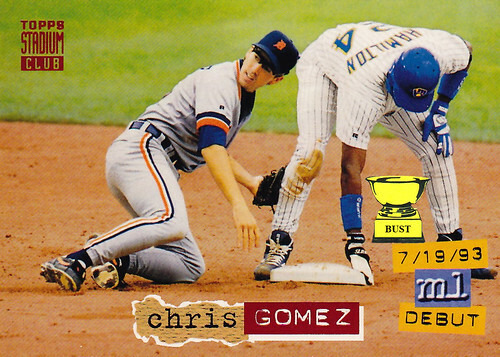 This will only take a minute: There's a reason for Chris Gomez's subpar career numbers — he wasn't a professional baseball player. In 1993, the commissioner's office began a push to get its players screened for prostate cancer. Of course, most players, young and athletic, were reluctant to have someone check out their plumbing. In stepped Dr. Chris Gomez of Lansing, Mich. The good doctor agreed to masquerade as an MLB shortstop, but when the opportunity arose — such as Darryl Hamilton's poorly timed base-cleaning above — Gomez would slip on a pre-lubricated rubber glove, yank on the baserunner's trousers and do a little scoping. This earned Dr. Gomez his share of roundhouse kicks to the head, and the commissioner decided his plan was flawed. The Tigers, lacking anyone else capable of playing shortstop, decided to keep Gomez on the payroll for a few more years anyway.